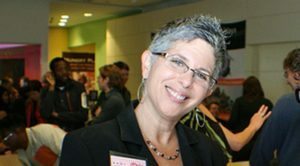 Wendy Levy is the Director of Creative Programming at the Bay Area Video Coalition (BAVC). Founded in 1976, BAVC is a nonprofit media arts center whose continuing mission is to inspire social change by enabling the sharing of diverse stories through art, education and technology. Among her duties, Wendy directs BAVC’s Producers Institute for New Media Technologies, a MacArthur-funded creative residency for eight international documentary teams to develop and prototype interactive, multiplatform new media tools and applications for social justice. Visit www.bavc.org. As Director of Creative Programming at BAVC, you have a lot of funders coming to you for advice. What do they ask you? They want help vetting proposals. The digital media landscape is still very scary for a lot of people. Most funders, even if they’re not making grants for film distribution—they still want to know what the producer’s distribution and outreach plan is. They need to know that the producer is thinking not just about how she’s going to make the film, but how she’s going to get people to see it, connect with it, and take action because of it. The fact is, just showing a film at festivals doesn’t cut it anymore. Nowadays, in order for a film to have a greater impact, the producer must leverage digital and interactive media. That might mean showing clips online, or forming an online community around the film, or blogging about the making of the film, or any number of other things. Funders want to make sure that producers are not just throwing out new media terms that are cool, like, “We’re going to Twitter,” or “We’re going to make an online interactive game.” The question is, how are you going to use Twitter, or why do you want to make an online game and how will it advance your goals? Funders want to see a high-quality film, but also for it to have impact with their core audiences. It’s often the outreach campaign that is going to solidify that part of the equation. A lot of the new media tools are allowing audiences to interact more with a film. The big catch phrase at conferences last year was “we are the people formerly known as the audience.” The “audience” used to be a passive designation. But now audiences want to participate, whether that’s by going online and mashing up [re-editing] your video, or responding to a blog post, or getting involved in crowd-funding. If a producer doesn’t have good content in a multi-platform environment, and doesn’t allow people to participate, it’s as if the film doesn’t exist. Think about the iPhone. Apple allowed anyone to create these “applications” or programs for use on the iPhone. There are now more than 25,000 applications that programmers—including many amateurs—have developed, that help you do everything from shopping for groceries to finding a parking spot to planning a night out. Since Apple allowed anyone to develop and sell these applications, the iPhone is a great tool now. It’s the same with films—audiences who get involved are what “complete” a film and make it high-impact. This is a paradigm shift in documentary film practice. Outreach is no longer just about reaching out, it’s about creating ways for the audience to reach into the story and contribute to it and rework it. Can you give me an example of some filmmakers that have used these new media in creative ways? Where to begin! I’ll give you a couple examples. Last year at the Producers Institute, we had Paco de Onís. While completing the final cut of Skylight Pictures’ “The Reckoning,” a film about the International Criminal Court, Paco and his web team were here developing an accompanying interactive map. People can click on a country on the map and get RSS news feeds about human rights from that country, or see video from the film about what the ICC is doing there. Or users on the ground can even send in updates via Twitter about what the International Criminal Court is doing, and those updates would be linked to on this map. So this way you see the film, you get the message—and you can get involved in what’s going on. Thomas Allen Harris came to BAVC last year to work on his new project, “Through A Lens Darkly,” about the role of photography in shaping African-American identity and community. He used digital media not just an ancillary thing after the film, but as a key part of actually developing the film and building a community around it. While the film was in production, he created an interactive digital database of African American photos globally. He’s developing this project where he goes city to city, people can bring in their shoeboxes of family photos and have them scanned into this database and get “tagged” or indexed by name or place or date. It’s like Antiques Road Show meets StoryCorps. People who have been silenced and unseen are now taking their place in history, and contributing to this online database of photographs. And the online component actually becomes a part of the film. It’s an example of people taking part in their own healing through this storytelling—and it’s outside the realm of traditional broadcast. Wonderful! What do funders and filmmakers need to know when they collaborate on projects like these? Everybody now knows that if you put up a Facebook group, that doesn’t necessarily mean anyone is going to join it. You have to tend to your online communities as if they were sitting right in front of you, and create an experience that they want to be involved in. That takes money, and it also takes some conversations that start early on about what kind of new media will serve a project. It’s very exciting stuff, these are powerful tools we’re talking about here. Some people might be inclined to rush ahead—but filmmakers and funders have to talk about strategy. What do we want to achieve? Where do we differ in our goals and how can we work together? What platforms will serve our goals? How do we measure all this? And that’s where I think the Prenups come in, is serving as a guide for those conversations.